f(x) successfully finishes its encore concert for "f(x) the 1st concert DIMENSION 4 - Docking Station in JAPAN"
f(x) has successfully wrapped up its first ever concert tour in Japan. From November 2-3, the girl group held its encore concert for "f(x) the 1st concert DIMENSION 4 - Docking Station in JAPAN" at Yokohama Arena, while 18,000 audience flocked to the arena to watch f(x)'s fantastic performance. Prior to this, f(x) held 6 concerts in 4 Japanese cities such as Tokyo, Nagoya, Osaka and Fukuoka, and all of the tickets for the concerts have been sold out. At the Yokohama concert, f(x) performed a total of 36 songs including its hits such as "4 Walls," "Electric Shock," "Red Light," "NU ABO," and "All Mine." And the girl group got an explosive response from Japanese fans by singing its first ever Japanese original single "COWBOY" for the first time. Well, here are a few things I've felt about f(x)'s concert. 1. SM always makes high quality show. 2. Luna proves her real worth at a live concert. 3. Amber loves to communicate with her fans. 4. Victoria has a stage presence. 5. Krystal is really pretty. 6. It would have been so much better if Sulli had stayed with the team. 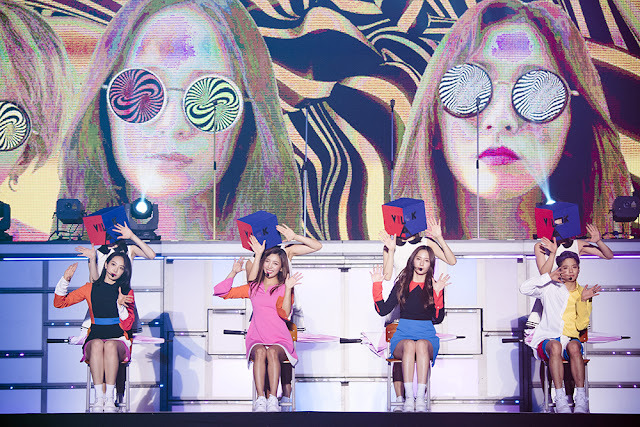 Anyway, check out more photos for f(x)'s concert in Yokohama.